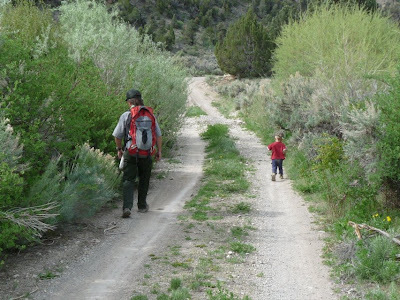 Yesterday we went for a hike with Charlie and his mom. 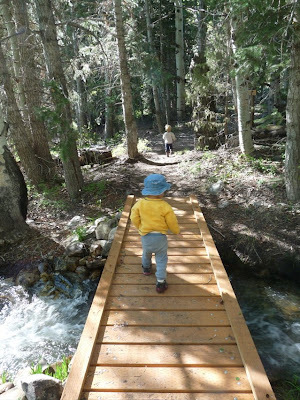 We found a nice trail that started with some bridges and went into the trees. Desert Boy and Charlie thought it was neat. 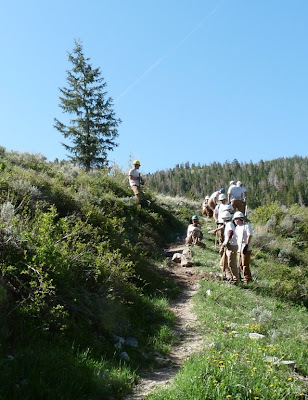 The trail crew was working on the trail and they paused to let us pass. 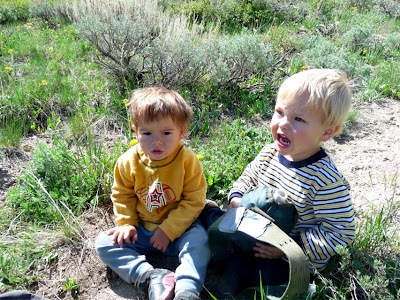 When we got up to a meadow, Desert Boy thought it was time for a snack. Charlie agreed. They quickly plopped down and awaited food and drink. Ah, the look of contentment. Neither wanted their own snacks, but the other's was great. 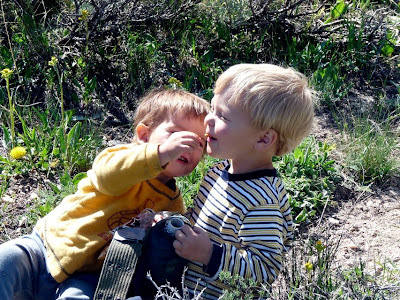 Charlie also had a good time feeding Desert Boy. 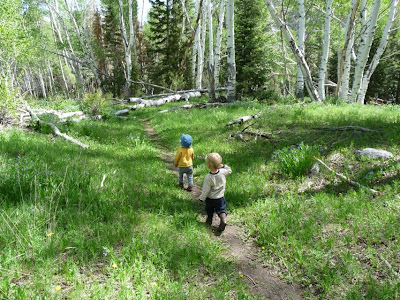 Then it was time to hike again, and they even held hands for awhile. I know, this all seems so gushy and gooey. 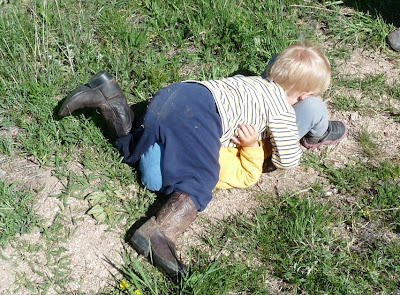 But after all the getting along, it was time to wrestle. Desert Boy didn't quite know what to think when Charlie took him down. And a second time. And a third time. But then he figured it out. Tackle! He wanted to make Charlie know he wasn't a wuss, I guess. And then they worked on some more takedowns. Fortunately they agreed to stop wrestling before either was crying or hurt. 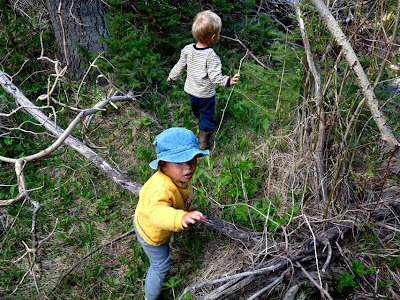 They were distracted with some obstacles, like branches to climb over and under. 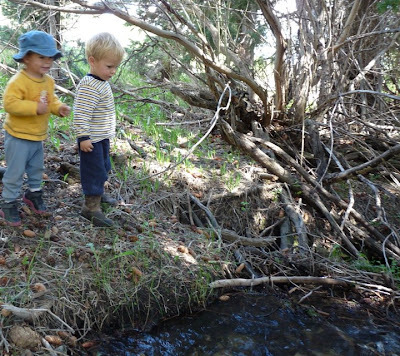 And then it was back to throwing stuff in the creek--pinecones this time. The moms enjoyed the beautiful display of wildflowers. 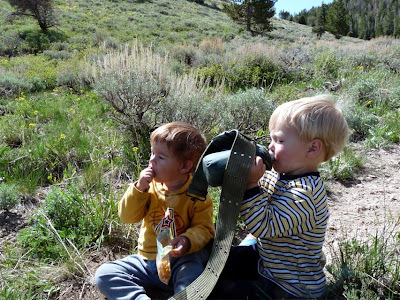 The little guys didn't seem to care too much about the wildflowers, but they loved the dirt, and some of the insects, the contrail in the sky, the birds singing, and of course the water that they had to keep revisiting and trying to jump in. 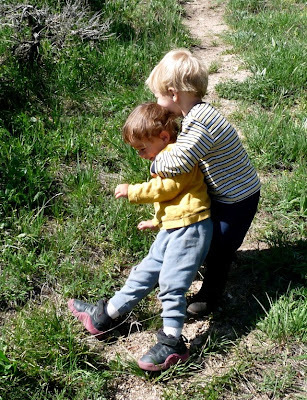 It was lots of fun hiking with a friend! While many birds are still singing their sweet songs trying to attract a mate, some birds have already had their young hatch. And in the case of the Great Horned Owls, the young are fledging, trying to fly and leave the nest. 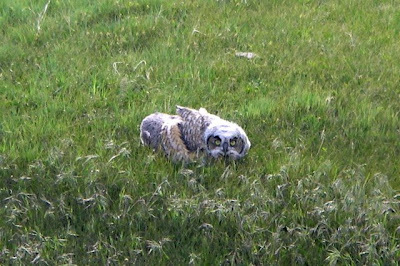 We found the owl above in the pasture right near our driveway. It was flopping around and couldn't get off the ground by itself. I think it eventually did because we didn't see it the next morning. 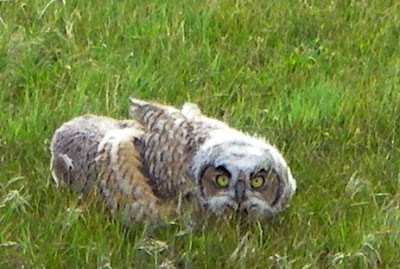 Great Horned Owls nest nearby every year, and it's always a treat to see their big, goofy babies. 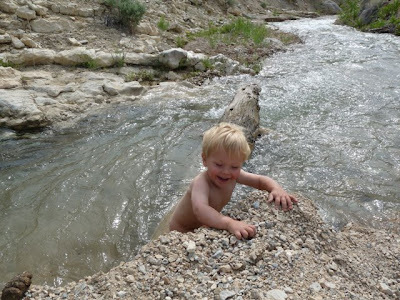 While we were out looking for wildflowers, Desert Boy noticed the wash led to the creek. I told him he couldn't jump in because he needed to keep his clothes dry. 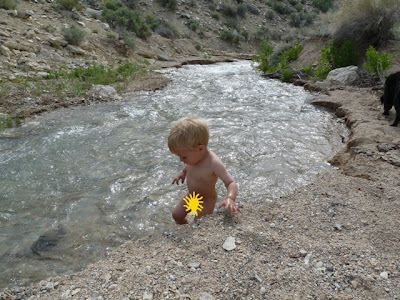 So when I finished photographing a flower and caught up with him, he had kicked off his boots and was tugging at his pants, saying, "Swimming, swimming." 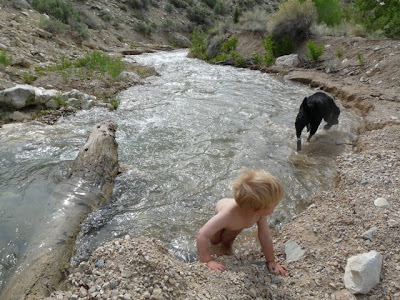 I looked at Henry in the creek, saw the water was running clear and cool, and decided, why not? So I helped Desert Boy strip off all his clothes. He hopped right in. 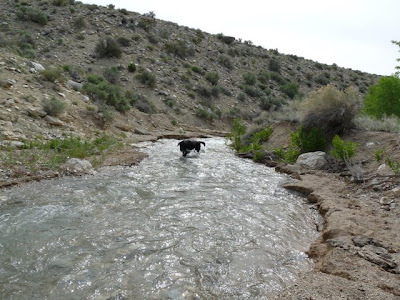 The water is snowmelt coming off the mountain, so it's cold. Desert Boy even flinched a little at the temperature--a true rarity. But he didn't want to get out right away. He wanted to play. After all, he needs to keep up with Henry, right? Desert Boy thankfully realized that the deeper, swifter water really wasn't a good idea and stayed close to shore. I kept wondering if I was going to have to jump in and get my clothes wet. 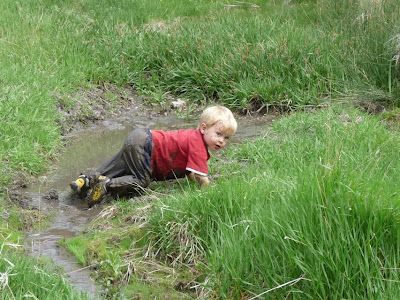 Fortunately, after a few minutes of playing and climbing in and out of the creek, he decided he had had enough. His little legs were red, but he didn't care. 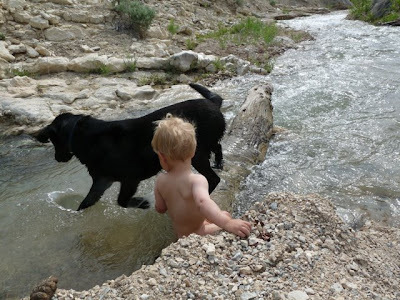 He had a chance to go "swimming." I have a feeling we'll be playing in a lot of water this summer! 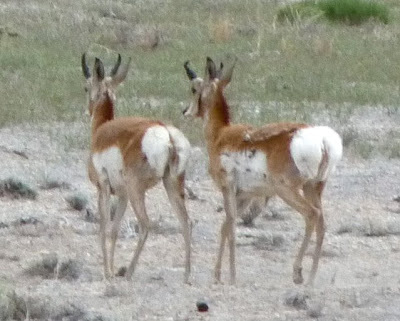 During our wanderings searching for snakes and wildflowers, we came across some pronghorn antelope (Antilocapra americana). They might resemble deer from a distance, but they're a bit smaller than mule deer, have differently shaped horns, and a big white rump. 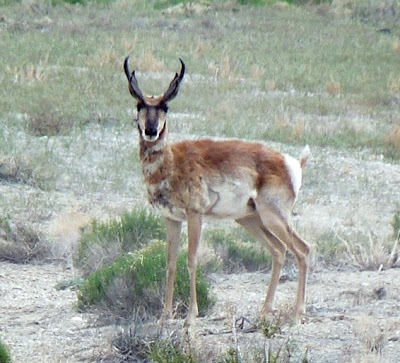 Pronghorn are also the fastest creature in North America. In the world, only the cheetah is faster. Pronghorn have been around for a long time, and they probably evolved to be so fast to get away from predators that are now extinct--like the American cheetah. They are well-adapted to eat sagebrush and can digest it better than other ungulates. Although pronghorn are really fast, they aren't good jumpers. When they come to a fence, they often go under it. It's a bit strange to watch a pronghorn crawl under a fence. You can learn lots more about this cool animal at Wikipedia. 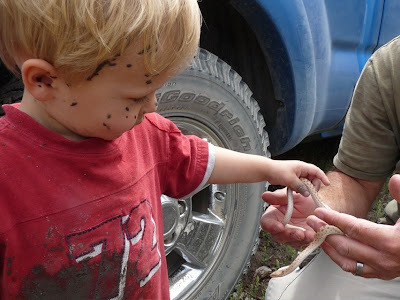 Desert Boy and I joined a group searching for kingsnakes, along with other snakes and lizards a few days ago. We knew it wouldn't be easy, but we were ready. Desert Boy started off trotting down the road. 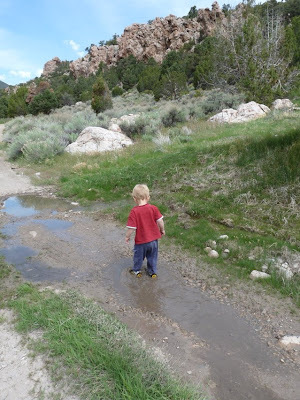 He found a puddle, and it was hard to convince him that we should go any further. But eventually we did. The wildflowers were stunning. I was surprised to find four different penstemons. Above is thickleaf beardstongue (Penstemon pachyphyllus). Do you see the really hairy staminode (hairy thing sticking out of the middle of the flower)? That's one of the ways to help tell penstemons apart. First look at color, then if the stems are hairy or smooth, and then if the leaves, corollas (flower petals), and staminodes are hairy or smooth. 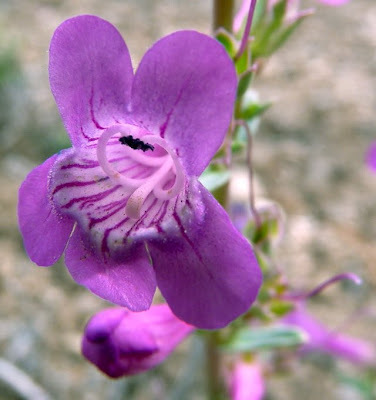 This penstemon has a smooth staminode. 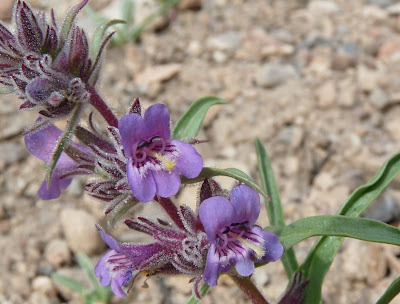 It's called Owens Valley beardstongue (Penstemon confusus). I really like the stripes on the inner parts of the petals. The bright red of this penstemon sets it apart from the other ones we saw. 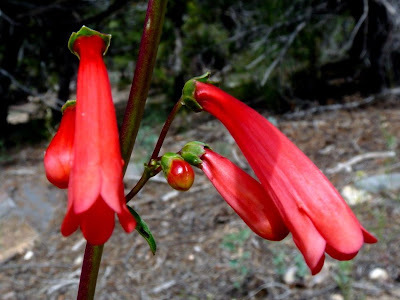 It has the great name of firecracker penstemon (Penstemon eatonii). 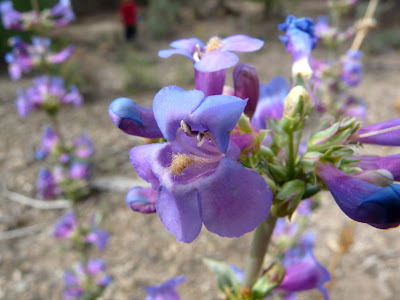 And one more...Tunnel springs beardstongue (Penstemon concinnus). It was a lot shorter than the other ones and had hairy stem and leaves. ...a lizard! This is a sagebrush lizard (Sceloporus graciosus). Do you see the stripes running down his back? Here is Meg searching up high on the hillside opposite us. 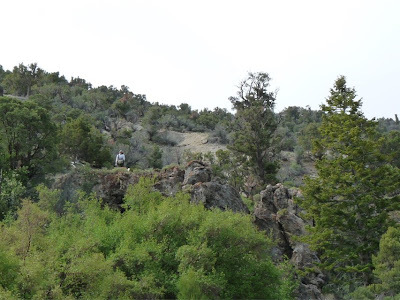 People went up and down, looked under dead trees and in rock crevices. Everyone spread out to cover as much ground as possible. 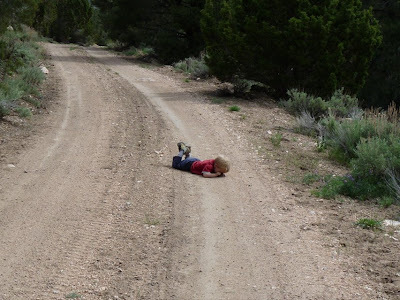 Desert Boy got a bit worn out from all the traipsing up and down the hillsides. But with a snack, he was ready to go again. 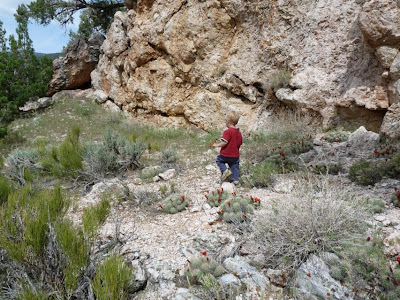 We went up to some rocks and found large clusters of Kingcup cactus (Echinocerus triglochidiatus). 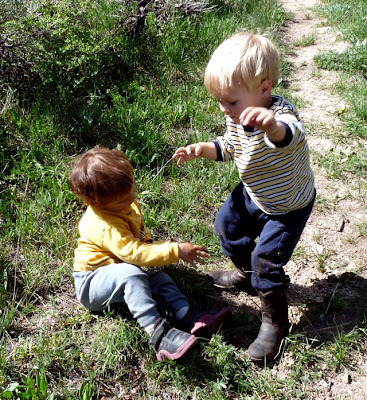 To my utter amazement, Desert Boy walked through them with nary a fall and a spine in his hand. On the way back down, we saw a different lizard. 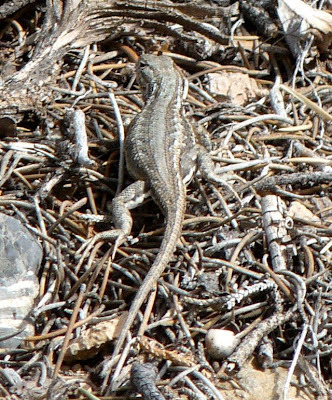 This one doesn't have stripes lengthwise like the sagebrush lizard, but instead has stripes going across his body. 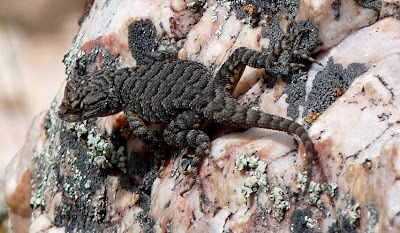 This is a western fence lizard (Sceloperus occidentalis). 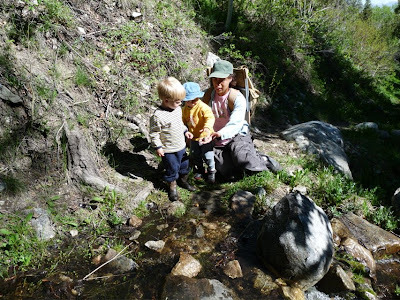 When we got down the hillside, we reached a little spring, and water was running across the road. You can imagine Desert Boy's delight. 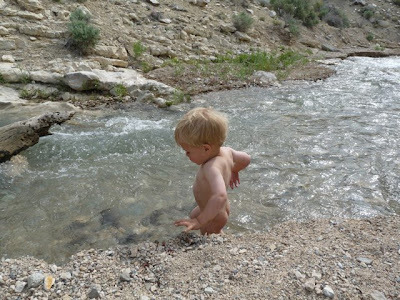 He was in the water faster than I could say "No," which is pretty darned fast. 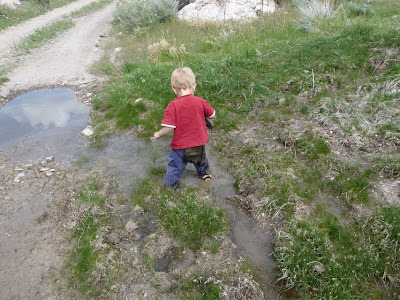 The only problem was that while I was photographing wildflowers, he somehow managed to find a muddy spot and fall down in it. 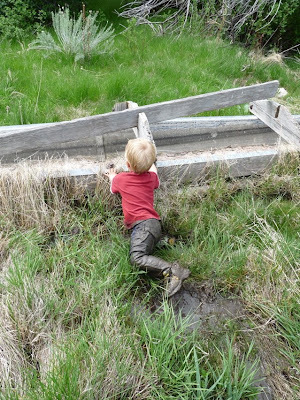 And before I knew it, he was in an even bigger mud hole and was scrambling to get out of it. 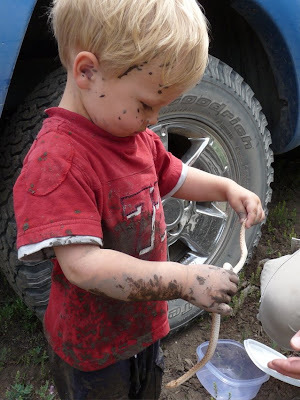 By this time I knew he was completely coated with mud, and it didn't matter if he got any dirtier. Oops. Might as well get entirely coated with mud. He wasn't too happy when I told him we had to start heading back to the truck, about a mile away. And he was going to have to walk the entire time because I didn't want to pick him and all his mud up. 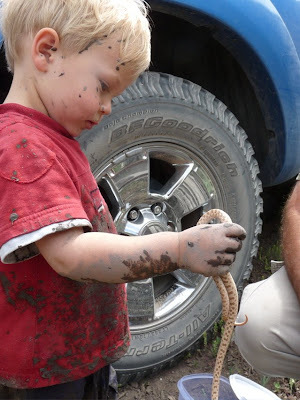 Fortunately, we came across some snake hunters who had better success. 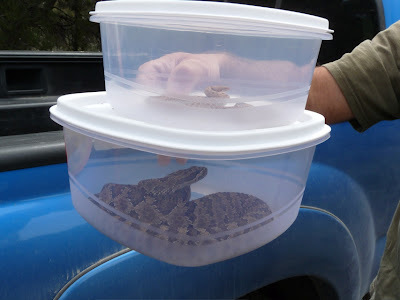 They had caught a night snake (Hypsiglena torquata) and put it in the smaller plastic container, and a Great Basin rattlesnake (Crotalus viridis lutosis). 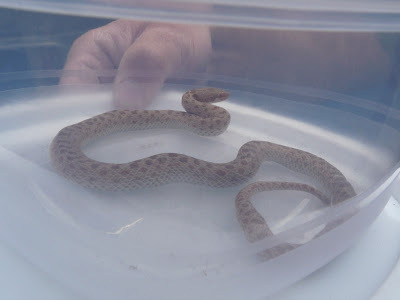 The rattlesnake rattled incessantly, so we put him back and took a closer look at the night snake. 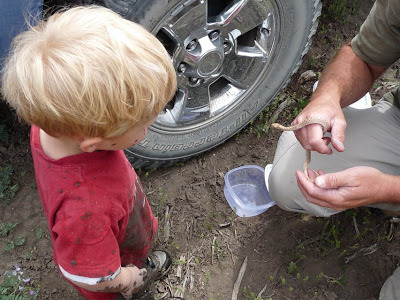 The biologist is showing the snake to Desert Boy and explaining how to handle him. Desert Boy reaches over to touch. 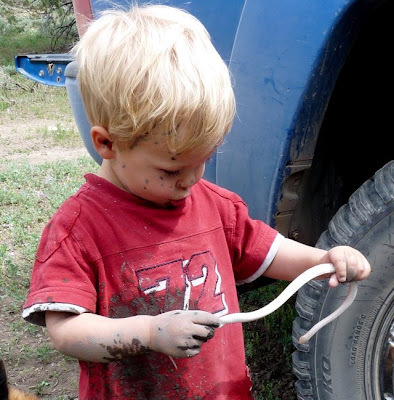 And then decides he can probably hold the little snake all by himself. He didn't talk while he handled it, just watched in fascination. 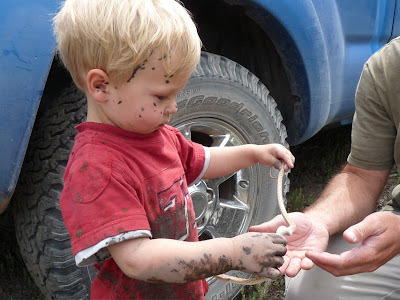 The snake may be wondering what all the mud is about. It typically hangs out in drier areas. So even though we didn't find any snakes ourselves, we felt pretty lucky to get to see a couple close up that others caught. This is turning out to be a fabulous wildflower year. 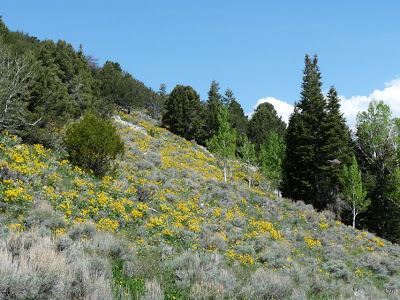 There are things blooming all the way from the valley bottoms up to 10,000 feet, where little buttercups are poking out next to melting snowbanks. 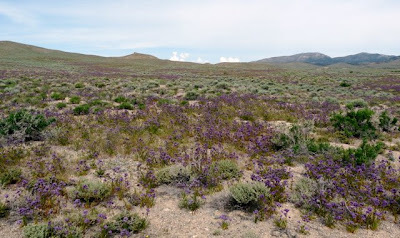 Yesterday Desert Boy and I encountered purple fields of Phacelia covering the foothills. 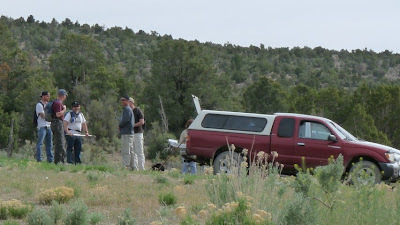 So today we're out and about, searching for more color in the usually drab desert landscape. 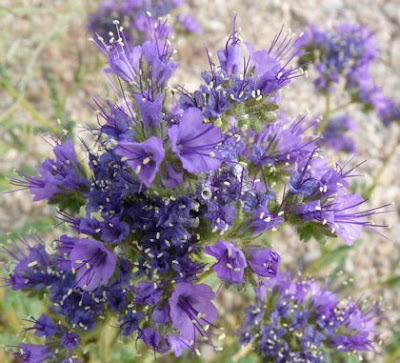 Here's a closeup of the pretty flower, notch-leaved phacelia (Phacelia crenulata). 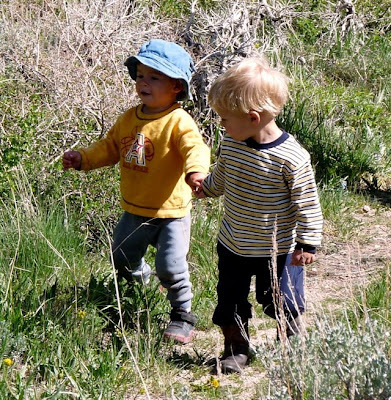 Go outside and have a good weekend!